Former presidents back Ukraine rally Jump to media player Ukraine's three previous post-Soviet presidents have given their support to mass anti-government protesters. BBC inside Ukraine protest site Jump to media player Protests sparked by the Ukrainian government's decision not to sign an association deal with the EU are continuing in the capital Kiev. Ukraine protesters occupy Kiev square Jump to media player Hundreds of protesters spend the night in Kiev's Independence Square, despite a failed attempt to force the resignation of the government. Ukraine opposition motion defeated Jump to media player The Ukrainian parliament has rejected an attempt to force the resignation of the government. Protesters cram into Kiev square Jump to media player Pro-European protesters have been rallying in Independence Square in Kiev on Tuesday evening. Ukraine leader 'miscalculated' Jump to media player Kennan Institute President Matt Rojansky discusses Ukrainian unrest with BBC's Katty Kay. 'Revolution' chants in Kiev protests Jump to media player Thousands of demonstrators in Ukraine have gathered for fresh protests in anger at the government's decision to back out of a trade and association deal with the EU, in favour of closer ties with Moscow. Ukraine's three previous post-Soviet presidents have given their support to mass anti-government protesters. 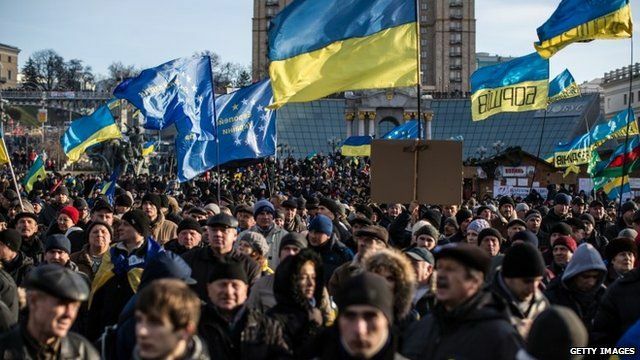 In a statement, Leonid Kravchuk, Leonid Kuchma and Viktor Yushchenko expressed "solidarity" with peaceful rallies. Thousands of protesters remain camped in Kiev's Independence Square, and are continuing to block the main government's building.